Here is an excellent product created for true mushroom lovers. The Mixed Mushrooms from Sottobosco Valtaro contain the best ingredients in a concentration of flavour of tradition. 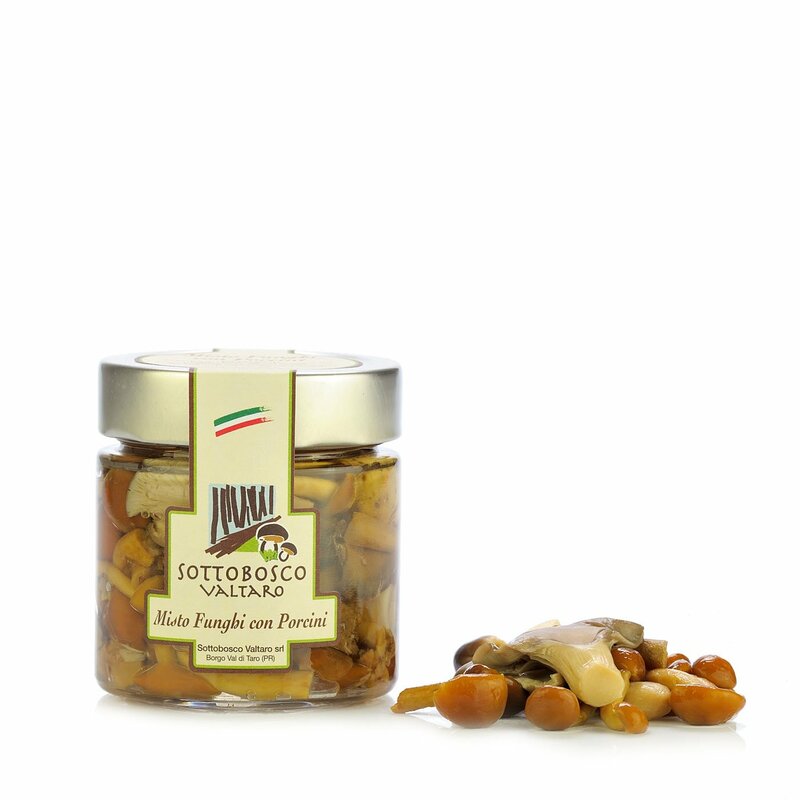 These attractive jars contain optimal porcini mushrooms together with honey mushrooms, oyster mushrooms, sanguinelli mushrooms, good olive oil and wine vinegar, with a pinch of salt. Perfect for a delicious aperitif, they also make a great side-dish and an original ingredient to enhance the flavour of many dishes. Ingredients Porcini mushrooms (Boletus edulis and related group) 15%, honey mushrooms (pholiota nameko), oyster mushrooms (pleurotus ostreatus), Sanguinelli mushrooms (lacterius deliciosus,lactarius sanguifluus), olive oil, white wine vinegar, salt, natural flavourin For more information on product labels, please contact our Customer Service department. The information on the labels of the products may vary for reasons beyond our control, therefore, there may be discrepancies between the information on the site and that on the products delivered. Please always check the information on the product before consumption or use. Fifty years ago, in the mountain area of Borgo Val di Taro (Pr), Gino Cardinali started his business with passion and determination, and which today is being run today with pride by his children. Sottobosco Valtaro offers delicious conserved products that make it possible to enjoy the flavours of nature all year long, with the certainty of having a product always collected when mature and processed according to the traditional techniques of the mountains where the company is located. The ancient recipes kept by the family are the secret to a truly surprising goodness.